Police officers are selling Cops for Kids T-shirts to help raise funds for their annual charitable program for children of impoverished families. Sgt. John Hedges said the police officers will use the T-shirt proceeds and monetary donations to take approximately 65 children shopping for winter clothing, shoes and Christmas wish list gifts on Dec. 11. 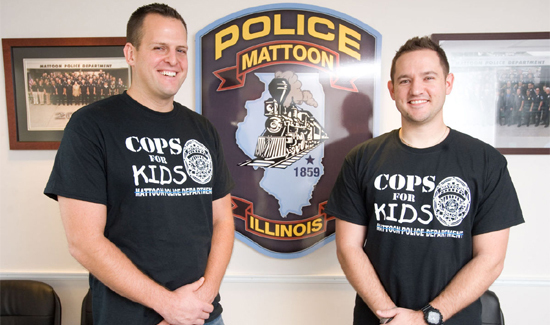 Application forms for children are available at the Mattoon Police Department, 1710 Wabash Ave.
Hedges said the idea for the first-ever Cops for Kids T-shirts was suggested by management at Don Sol Mexican Grill. He said Don Sol employees often wear the fundraising shirts of charitable causes that this restaurant supports. The black Cops for Kids T-shirts are available in sizes ranging from small to various extra larges for $20 each at the police station. Hedges said Don Sol and the Odd Fellow-Rebekah Home both recently held Cops for Kids fundraisers, adding that additional fundraisers are always appreciated. Hedges also said he and his fellow Cops for Kids organizer, Officer Alex Hesse, are available to speak to community groups. Now that he has been promoted to sergeant, Hedges said he is preparing to turn over the responsibility of organizing Cops for Kids to Hesse. He said Hesse has already been bringing a lot of enthusiasm and fresh ideas to this role.